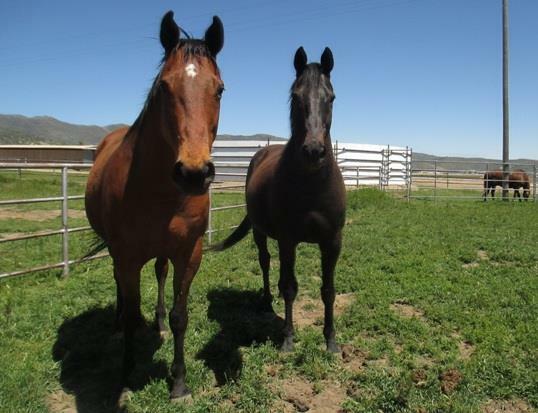 At the start of her rescue effort, Meredith acquired horses from feedlots and most of those horses brought to UPF in the mid-nineties were young. Today many of them still live at UPF; more than half of the horses at the foundation are over twenty years old. Today, UPF works with racetracks in southern California, northern Arizona, and other nearby areas upon request. When a new horse arrives from the track, Meredith says, “we’re hoping that we get good information from the trainers about their injuries. But we take anything, sight unseen.” Once the horse reaches UPF, it has a permanent home unless a suitable adoptive home can be found. TCA’s grant supports the care for the horses at UPF as well as other operational expenses. Meredith specifies, “It helps us buy hay and support our staff. California is known for its high cost of living.” Despite their far-reaching impact, UPF only has six employees, three full-time and three part-time. Meredith recognizes that Thoroughbred aftercare is an essential part of the racing industry: “Sixty percent of the Thoroughbreds that are racing are done by the age of four. There are lots of foals each year, but only a small percent find room in Thoroughbred sanctuaries.” She hopes to see an increasing number of aftercare organizations like UPF.